Skype breakfast & new Kitties | Help! I live with my Italian mother in law! Elora and I live in the same city but quite often we find each other on Skype. It’s far cheaper than using our mobile phones and Mama has our house phone super-glued to her ear anyways. Every morning I spot Elora on Skype just like I would bump into her at the local Starbuck’s (or Tim Horton’s for my Canuk readers). Our conversations are all over the map discussing work, health and just daily life. I told her that was thinking of buying a Ragdoll cat for November. Although I truly believe I did the right think rescuing Stelle from the Gattile I think this time I need to have a young cat that will hopefully be around for many years to come. My heart can only stand so much heartache. Me: I really want her but they are quite expensive. E: So how expensive is this Ragdoll kitten? Me: Did you fall off your chair? Me: Are you kidding me? For 800 Euros this kitty should be driving the car home! Will you let me drive the car to Leah's? 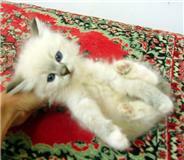 This entry was posted in Mama, Nature and tagged cats, cattery, pet names, pets, rag doll, ragdoll breed. Bookmark the permalink. I like Cocoa too, sounds like a great name and hope you can get that kitty to take the place in your heart that you need since Stella passed on. I vote for Coco too, it’s a lovely name for that lovely cat :-)!